The first project on the list was filling in the grooves of the panel walls so they don’t look like paneling. It’s not a difficult job, it’s just a slow job. Before I could fill in the grooves though, I had to sand the walls. 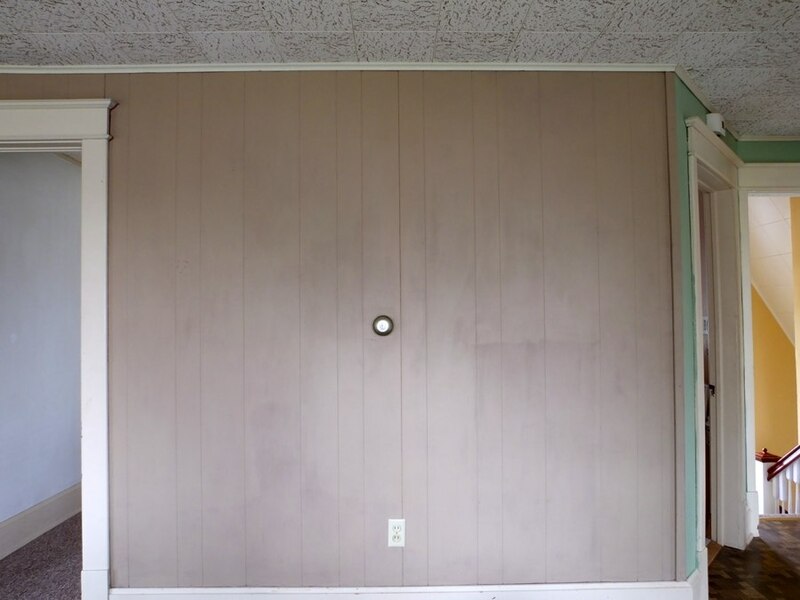 For some reason, the walls in the whole room were a very rough, sandy texture. Rough as in, I think they were painted with that outdoor, non-skid floor paint. We’re not totally sure, but that’s our best guess. After the sanding, I used joint compound to fill in the grooves and disguise the paneling. Just like patching a small hole, you fill the groove with compound, then scrape off the excess. The compound shrinks as it dries, so second coats are required. And as of this morning I’m still working on the second coats. Once it’s dry, the walls will be primed to cover the different textures. But before the walls can be painted, I’ll have to prime and paint the big foam-paneled ceiling. 🙁 By the time I make it through that giant project, I will probably have made it through an entire audio book. But it will look SO MUCH BETTER once it’s done. 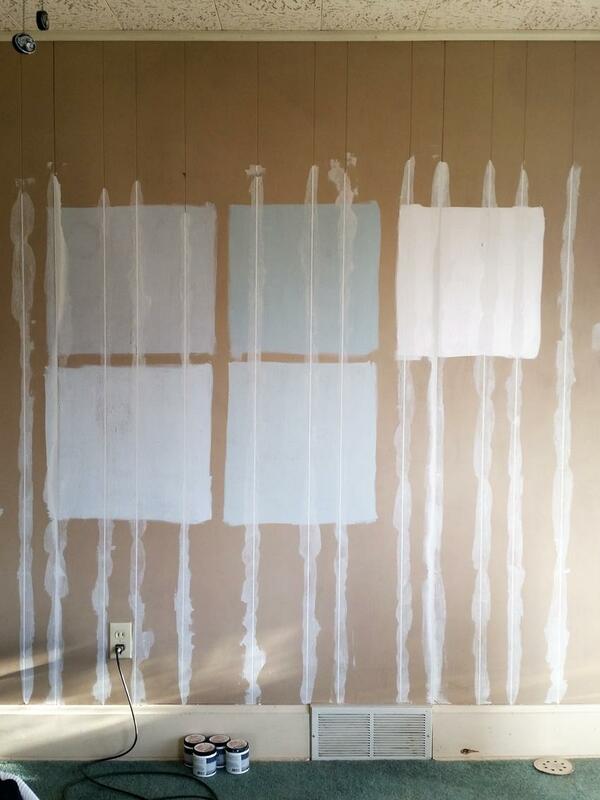 Early last week, I still had no idea what color we’d want on the walls, so I put up a few paint samples. They’re all colors we really like (in fact, the living room and kitchen were just painted the top left color), but they all just looked terrible in this room. We really wanted something with warmer undertones, so I brought up the paint I bought for the office just to see what it would look like (top right), and we both loved it in here. So that’s where we’re at! Hopefully by next Thursday, the ceiling, walls and trim will all filled, patched, repaired, and repainted! ORC Final week! 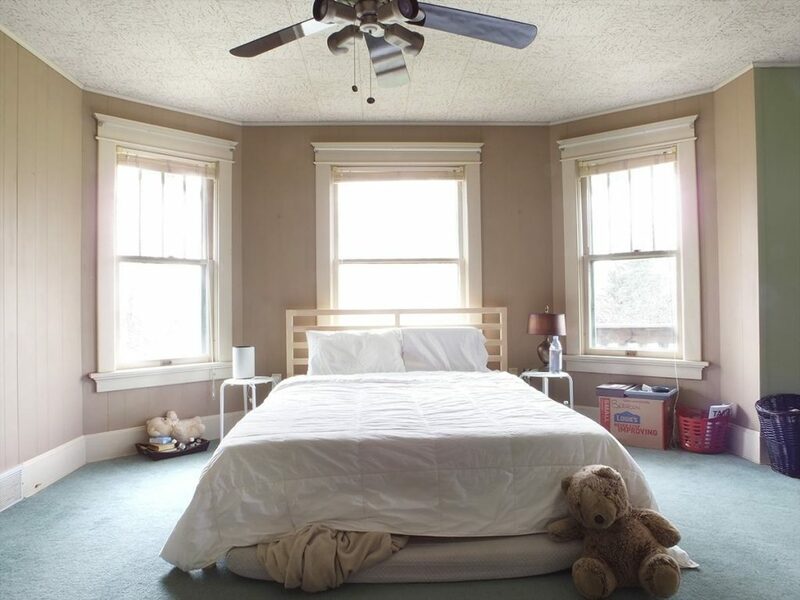 The bedroom makeover is done. Filling in those grooves looks like SO much work! I’m sure it’s going to look great once it’s all done and painted. Can’t wait to see your progress next week. Good luck with all the painting! Christina I adore the direction that your room is headed towards! You did SO much better than I did in my room this week. I would love for you to share this post at Thoughts of Home on Thursday. I think our readers would really enjoy it! Good luck in the upcoming week! Thanks Laura, I’ll check that out! It’s coming along! I like the paint you chose. Would you share the color/brand? Absolutely, it’s called Pebble, from the old Martha Stewart colors they used to have at Home Depot. When I go to buy more I’ll make sure it’s in their system, and you can ask for a sample of it by name since you can’t get the swatches anymore. I love in progress “ugly” pictures, as it ere. I love seeing the process unfold. I think listening to a audiobook is genius. What are you listening to? Happy painting this week. I think (I hope) that’s what I’ll be doing, too! Currently, Think and Grow Rich by Napoleon Hill. It’s odd and fascinating, and there are some really interesting ideas in it. Don’t know what I’d do without audiobooks and podcasts while I’m working on the house(s). Can’t wait to see how your project is going!